NV200: Seat and Bed is here (Rusty lee rock n roll)! – Do your dream! 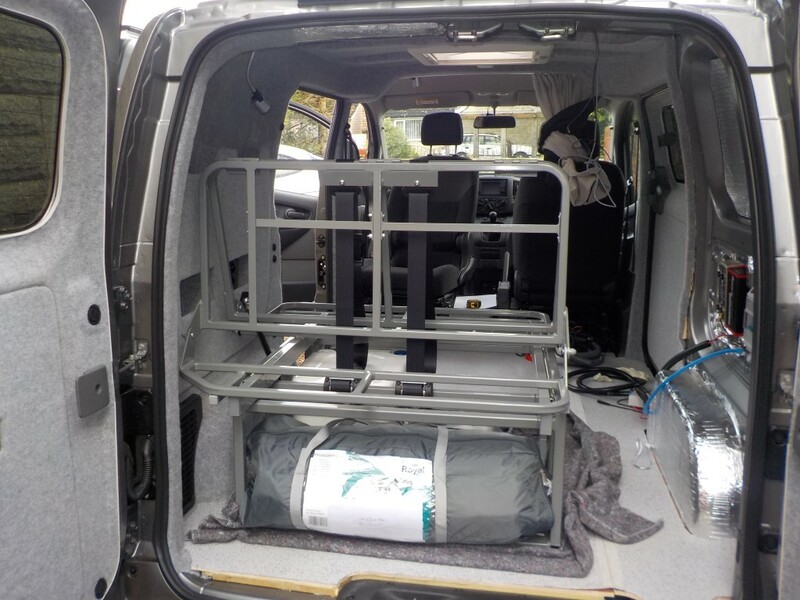 NV200: Seat and Bed is here (Rusty lee rock n roll)! In a normal sized van, like a VW, there are a multitude of suppliers selling ready made beds of all sizes and budgets and quality. But, go for a custom sized bed and the choice plummets dramatically! And for us, getting a bed/seat that fits exactly where we want it will make or break the van and make it usable (for us) or not. 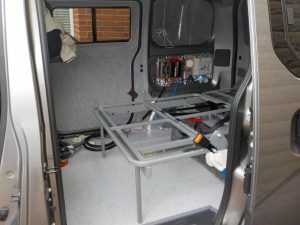 Its the most critical thing which the whole van is based around. Looking around, some of the Rock n roll beds have normal hinges which mean the cushions never fit properly (!) – so in bed position you have a gap, or in seat position they are squished, or the bed boards are loose. We don’t want any of these…. So this limits the choice further. 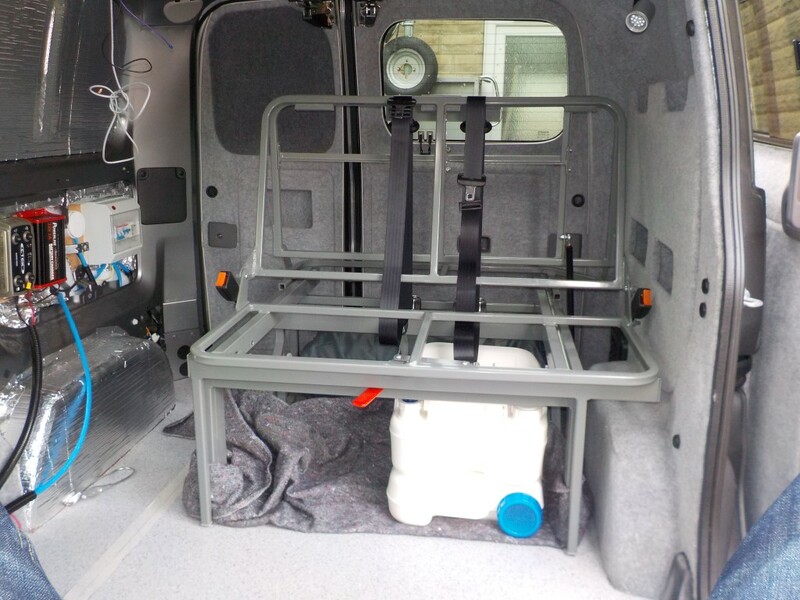 As the NV200 will also be a car, we want 4 belted seats, and this brings into question “crash tested” beds or not. Once you hit custom sizes this is impossible anyway. Also, in my view, campervans/motorhomes will never be as safe as a car in the back anyway – and this includes coach built. In a big off, regardless of how well tied down, bonded or bolted, wood furniture will rip out and stuff will fly around anyway, probably including fridges, batteries, gas bottles, knives etc…. Also, the rear of vans aren’t safety zones or have crash protection like a car. And you can never get type approval or any other approval – best we can do is MOT standard. As the seats will be seldom used, that’s the balance for us. What we can do however, is ensure the bed/seat is strong and well made. Some cheap ones will pass MOT but you can see how they’d react in an accident, bend or fail etc. So we avoided these. We studied pictures of approved beds, welding quality, angular bracing, size of steelwork etc, and then tried to find a maker whose beds were of similar ilk. And we found VW Rusty Lee (http://vwrustylee.com/ ) – who assured us he could do anything we wanted (!). 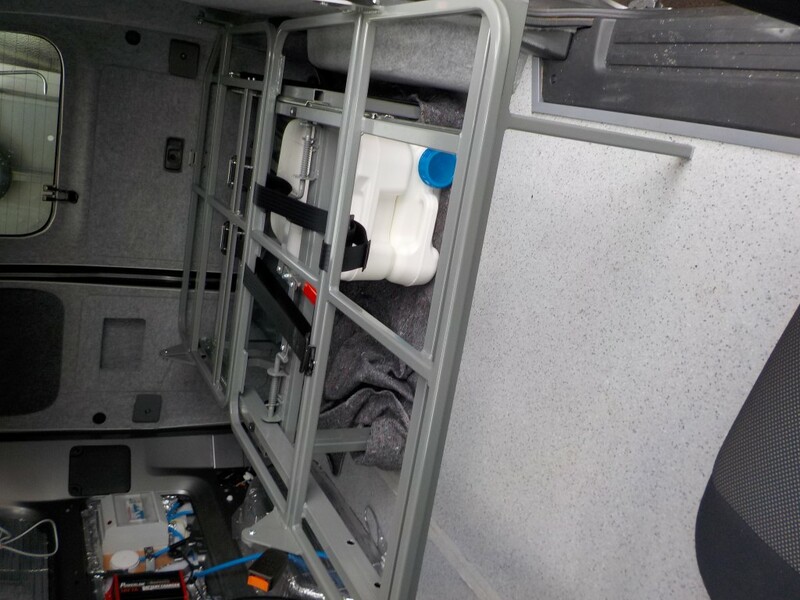 On his comments assuring we could get what we wanted, we bought the van 🙂 …..
…. then we went to see him once we got the van. Due to holidays the lead time was longer than hoped, but in truth, the bed was ready the first week we were ready for it. Rusty Lee gave expert advice, suggested changes, told us we were mad (! 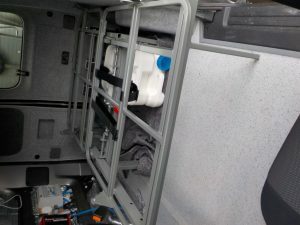 – he may be right), gave advice on van which made us change how we did the floor, and was clearly an expert on his beds. Also, the workmanship is excellent, seeing other beds made and the quality of the builds was impressive – clearly a skilled man. 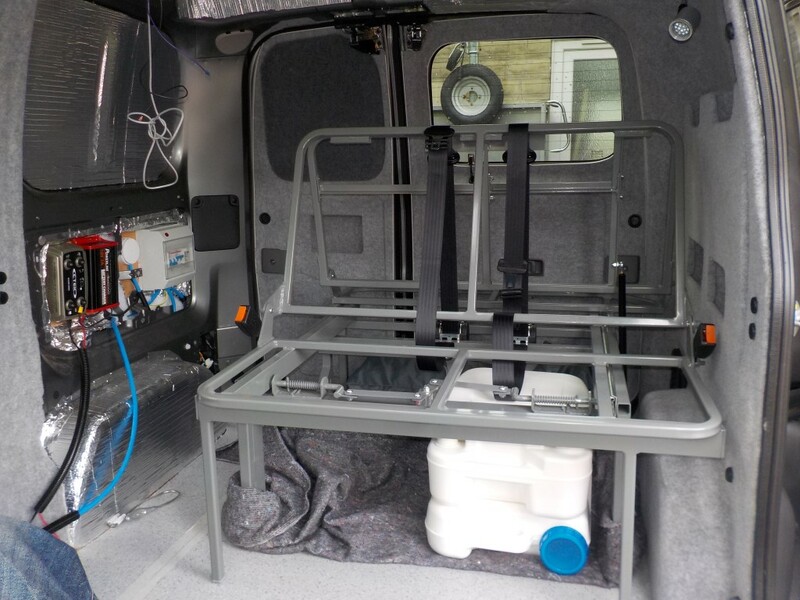 Well – we always said the van build will succeed or not based on how the bed works and everything fits around it. And, well, WOW! 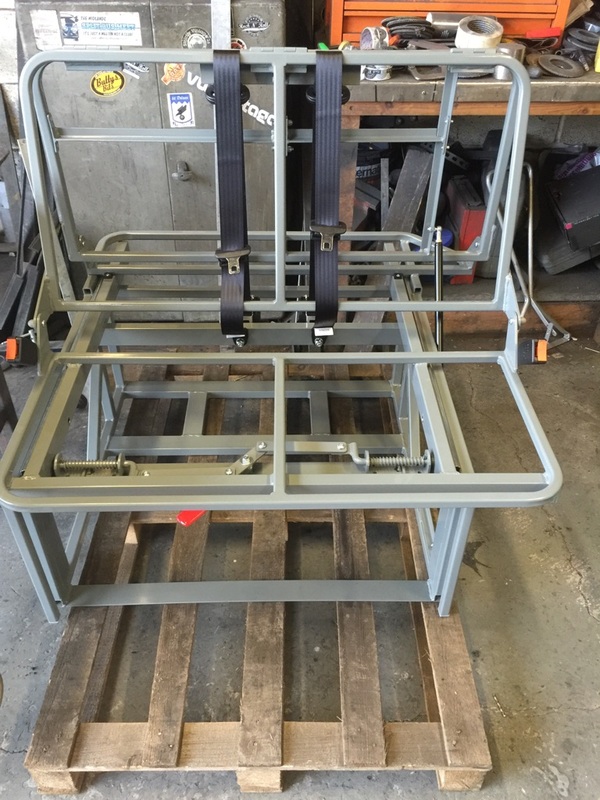 Rusty Lee is bloody awesome – we were impressed when we collected, but got it home and put it in the “right” position and its virtually mm perfect! Everything we hoped was possible – will be! The loo fits PERFECTLY and with enough room to box. 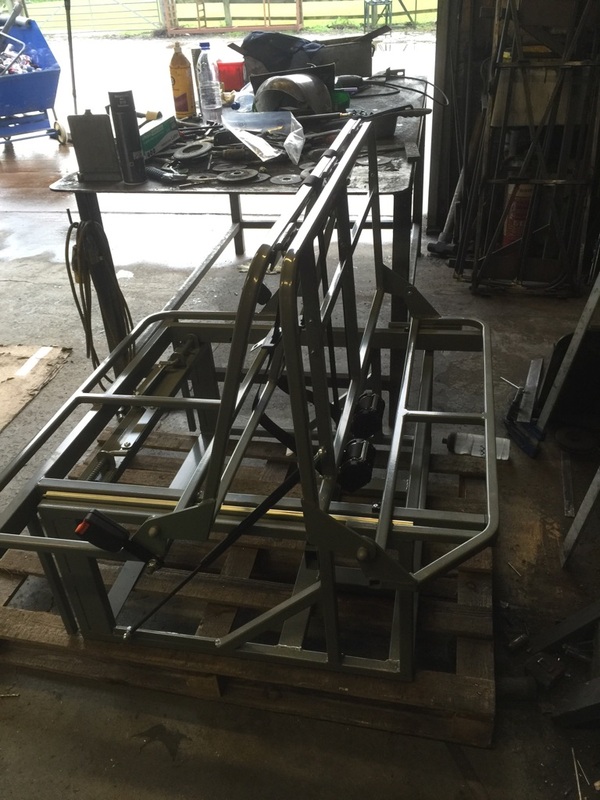 MASSIVE rear area – our awning and outdoor chairs will fit here. And the rest of the design impresses – watching how the bed works, what touches what (or not) – and its an incredible piece of engineering. Furniture line can be exactly where hoped – so battery location and gas locker will fit where we hoped. I’d be interested to know how wide your bed is. Can i ask what is the dimension of the frame of bed please? Think frame is 950w x 1550l but board (to doors) is 1000w and 1650 I think. The loo has about 5mm clearance sideways when bed is down. We have enjoyed reading about your adventures in your NV200 so much so that we have paid a deposit for a year old NV200 Combi. However we have just hit a bit of a snag as I have discovered that taking out the rear seats will be classed as a modification and will invalidate any insurance. This is now putting us off completing the purchase. Could I ask you who you are insured with as they presumably are ok with the changes you have made. Any advice would be greatly appreciated. I’m surprised removing rear seats in the combi would invalidate insurance? 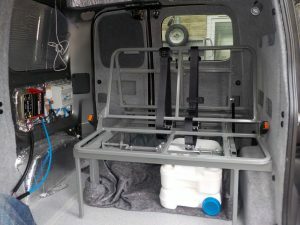 For the first year, I was with Brentacre (Mark Study) who insured it as a van during the conversion, and were aware of all changes so I was fully legit. My challenge was that I wanted a self-build campervan AND class-2 business insurance, and sadly the two didn’t readily mix. So the above two, especially Brentacre, were very very flexible in modifications and not *that* expensive. (Though told, my paperwork n renewal wasn’t 100% perfect, hence I left). Thanks. We are now the proud owners of a one year old NV200 Combi. I have removed the row of three seats and have it in writing off my insurance that they are ok about it as you said. The plan is to use it as it is for a while and then look to make modifications. Have bought a quechua pop up awning which is great. Brilliant!! Good luck with it. I have been looking at the Nissan NV200 for some time but your conversion has now made up my mind. I was initially looking at the Combi but your comments have now made me look at the van. I noticed in one of your comments re insurance that you said you wanted it for business as well as pleasure. Did you get the VAT back on the vehicle based on the dual use? No, our business is not vat registered so that wasn’t an option. Business use for us is just commuting. It was a 100% private purchase away from the business. If it was used as a van for a VAT registered business use,, then you may be able to get the vat back and/or tax relief – but you would need to use it as a van for the business. 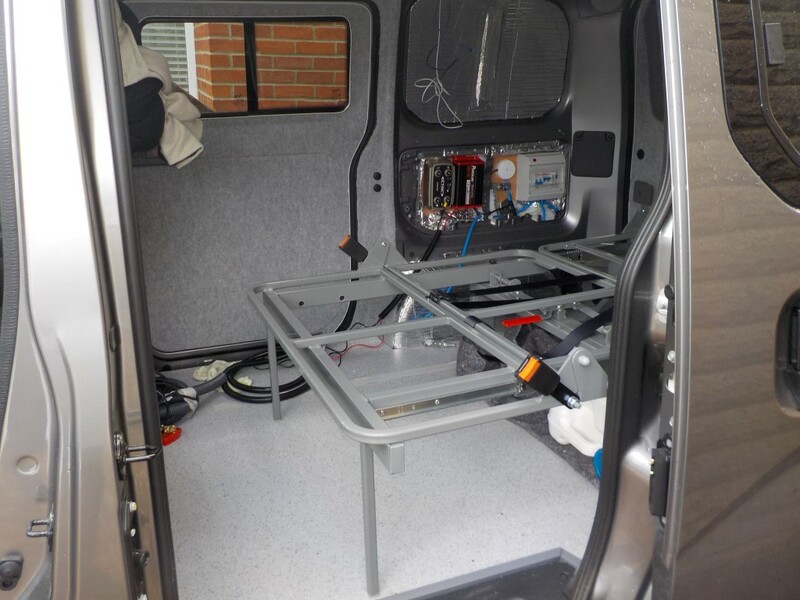 See your accountant as it probably is pushing the boundaries 🙂 Using it as a van for 3 years then selling to yourself to convert may be possible – and why we see so many VW T5 trade vans!